Since his debut on PBS in 1983, painter Bob Ross has been a cult favorite, known for his whisper-soft delivery, curly hair and “happy little trees.” After his untimely death in 1994, Ross’ work has lived on in reruns, and now on Netflix and YouTube. And for wannabe Chicago artists itching to try out their painting chops in front of an audience, a new event gives them a chance to match wits—and palettes—with Ross. Albany Park’s Nighthawk opened last summer. It’s a coffee shop by day and bar by night, gutted and renovated after years as a dingy dive. Nighthawk’s Bob Ross Night is held every other Wednesday—though his presence at the bar was originally more decorative. The event, cheekily called “The Joy of Drinking” as an homage to Ross’ show “The Joy of Painting,” features two people randomly chosen to paint along with an episode while the rest of the bar watches and cheers them on. And for spectators, there’s a Bob Ross-themed drinking game, too. Some of the drinking game’s rules (which can change as Swanson sees fit) call for a drink when Ross talks about a small woodland creature, when he says “big decisions” and when he says “slap the devil out of it” when cleaning a paintbrush. Despite the variance in talent, when the moment of truth comes, the bar is fully behind that night’s artist. Painter Shelbie Janocha said she didn’t come intending to paint—she came intending to laugh at people painting. Shortly after starting Janocha knew she was out of her league, and eventually went rogue. “People are having a really good time reliving some memories and cheering on someone that usually doesn’t know how to paint,” Windmiller said. 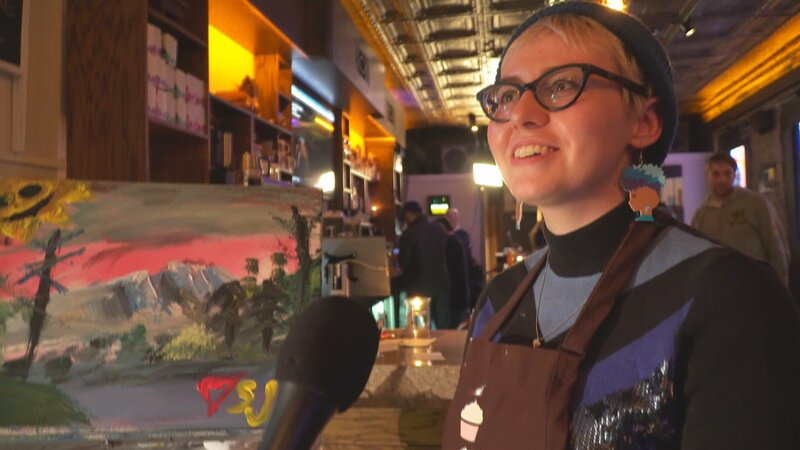 “The Joy of Drinking”—Bob Ross night at Albany Park’s Nighthawk—is held every other Wednesday. The next one is April 19. April 17: The city’s annual Summer Film Series returns with a line-up of Chicago classics and two of the most-buzzed about movies of 2016. March 1: Geoffrey Baer explores why hot dogs and ketchup don’t mix in Chicago.